Nations Cup record: 1 previous appearance - exited 2012 in group stage. Niger are looking for their first win at the finals, having lost all three of their group matches when they made their tournament debut last year. But they are notoriously poor travellers and it was only their home form that ensured they reached South Africa as they came back from a final-round qualifier first-leg 1-0 defeat at Guinea to go through after a 2-0 home victory in the return leg. 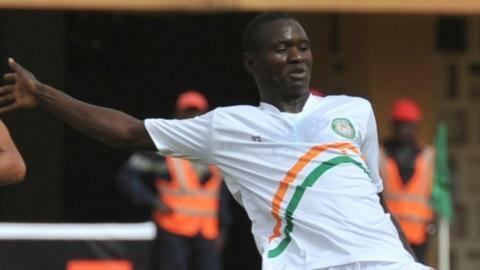 This over-reliance is a major weakness in the Nigerien game, and they will need to improve to avoid a repeat of 2012. The major blemish on their debut was the way in which Harouna Doula, the coach who guided Niger to their first finals, was summarily replaced by Rolland Courbis midway through the finals - but the Frenchman has since departed, with former Gabon coach Gernot Rohr now in charge. Although he is realistic about the difficulties of the group draw, the German is confident Niger can spring a surprise by at least picking up a point in Group B - which would be a greater return than the solitary goal scored by lively midfielder William Tonji Ngounou during their maiden appearance. Moussa Maazou was the star of Niger's 2012 Nations Cup run, sparkling with his terrific strength and running ability, and Niger will be again be looking to him to provide the spark that can help them compete this time.